It is surprising how little the general public knows about private commercial space programs and accomplishments. Let’s review a few significant private space programs and projects already in progress. SpaceX was founded in 2002 by Elon Musk, creator of PayPal. SpaceX has launched satellites into low orbit as well as successfully recovered a prototype crew space cabin from orbit. Under a 12-mission contract with NASA, they successfully docked their first cargo mission in May 2012. Massively funded by Sir Richard Branson, Virgin Galactic space planes are slated to begin suborbital flights in 2013. In fact, on April 29, 2013, they completed the first rocket-powered flight of space vehicle SpaceShipTwo, the last phase of testing before commercial space flight begins. Robert Bigelow, a major owner for the hotel chain Budget Suites of America, has invested $200 million in space stations and is willing to invest up to $500 million. Bigelow Aeropsace already launched successful unmanned space stations using Russian launch vehicles. Planetary Resources plans to mine asteroids for their rich mineral content. The company’s founders include movie producer James Cameron, Google’s CEO Larry Page, and Microsoft’s former chief software architect, Charles Simonyi. An asteroid recovered by NASA. Space tourism is becoming reality due to private commercial space programs. Perhaps the right people will read the book “What If We Made Space Travel Practical?” to help make commercial space programs more affordable, for them and for the public. 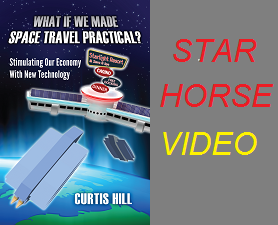 Please check out the web site www.StarHorseProject.com in order to understand more about making space travel practical. Would you book a flight on a Virgin Galactic space plane if you could afford it?